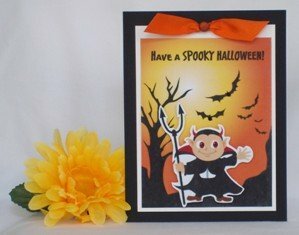 For handmade card ideas, be inspired by sketches to make unique Halloween cards. 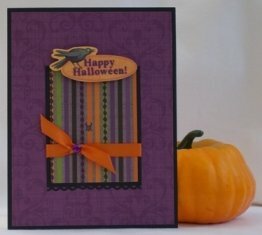 Use a border punch and pumpkin stickers for Halloween card ideas. The sketch I used for my Halloween greeting card is pretty simple to make. The sketch is from an ebook I purchased called 50 Card Making Sketches. I think the paper the author uses is a bit outdated but her ideas are cute and I've used several sketches for many of my homemade card ideas. When making Halloween cards, it helps when you start with the pattern paper to help you coordinate the colors. For my happy Halloween card, I used a polka dotted paper from a paper stack. Since the polka dots were different colors, I had a good selection to choose from so I chose all the colors for the color palette on my Halloween card making project. 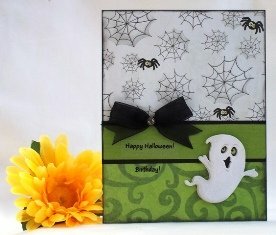 For many of my paper card making ideas, I enjoy using a craft punch and for this Halloween card craft, I used a border punch on both sides of a strip of green paper. Using it on green paper against a dark background helps bring out the design of the punch. Homemade Halloween cards are fun to make because there are so many cute stickers and embellishments to choose from. 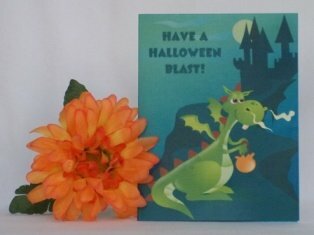 Make a Halloween card from die cuts. I found a pack of die cuts that are normally used for scrapbooking but the images were so cute that I knew they'd be great embellishments for my homemade Halloween card ideas. Of course, what's Halloween without pumpkins. This pack of die cuts had so many pumpkin shapes and sizes that it was hard to choose from but I did finally decide on one for my handmade Halloween card. I added foam tape on the back so that it made the die-cut more dimensional. To make the sentiment on many of my handmade Halloween cards, I use my computer and print it out on clear adhesive labels. Once the label is printed, just peel in out and stick it onto your colored paper. I would test it out first on a scratch piece of paper just to make sure the label is not visible on the paper. Sometimes, certain types of paper shows the label and it doesn't look very attractive. 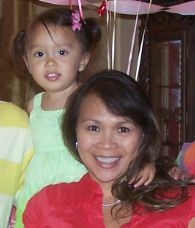 For your homemade greeting cards ideas you can use just about any embellishment you choose. I like some of my Halloween card designs simple so I just added a purple ribbon and placed my sentiment over it. When you build your own Halloween cards and are layering paper, use contrasting colors over each other so that each layer creates a border. I like the border colors to be solid colors so that it keeps the eyes focused on the embellishment or sentiment but that's just my preference. 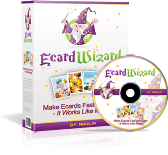 You can do whatever you like for your handmade card making projects. 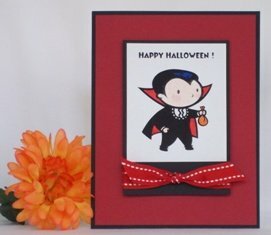 If you haven't already made Halloween cards this year, try my cardmaking ideas to make Halloween cards and see what you can create with your own style. You're sure to make unique Halloween cards everybody will love.